Read on to find out about a fantastic GIVEAWAY! Hello everyone! 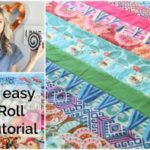 Well, it’s finally finished… a 5 part free video series teaching you how to make a quilt from start to finish. 2 hours of content! I have heard some amazing feedback about this series and I’m so glad people are finding it helpful! This 5th video shows you how to bind your quilt using a straight grain method by hand (meaning you machine stitch it to the front and hand stitch the back). What do you think of the quilt? Here are the links for the other videos in the series in case you missed any of them! My sponsors really rocked it out and helped to make this series possible! We gave a ton of stuff away, I am really proud of how this video series turned out! A huge thank you to my sponsors for this series! Here are some of the products I used in this video that were very helpful! I hope you enjoyed this series as much as I did. It was a blast to use this beautiful fabric and teach you what I have learned over the years! Here is video 5, how to bind and label your quilt! Melanie-thank you so much for all your amazing and informative tutorials on crocheting and quilting. You have given me the courage to try to make my first quilt ever. I have a question regarding fabrics. You recommend JoAnn Fabrics for lots tools etc but you don’t seem to recommend them for fabrics. Have you ever used their Keepsake Calico cotton fabrics? The price is $9 per yard which is similar to local quilt shops. They carry Robert Kaufman Kona Cottons which you do recommend. Is there a difference in Kona Cottons from other quilt shops and JoAnns? I have tried researching this on the web and the reviews are mixed. Can you please give me your thoughts? I have made many quilts in the past few years, yet every single time I sew on the binding I get confused whenI hit the corners. I have watched your quilting series and I finally feel like I have it embedded in my brain! Thank you so much for your great tutorial! Also, I love your YouTube channel, it has become my favorite! Keep up the great videos! I’m a beginner sewer and have been inspired to get into quilting! So I would probably use the fabric for a small throw quilt as my first endeavor in the quilting world! I would love to use that fabric to make some pillow covers. I got some free pillows with a new couch and I want to sew some new covers for them. I love the colors! I would use the fabric either for placemate and/or reusable gift bags for my family and friends. I don’t have the patience for a quilt, but little quilted projects are totally my thing! If I won this lovely bundle, I would definitely make a cuddle quilt for my daughter and I. We love snuggling on the couch, looking at new sewing projects to work on together. She’s 7 and loves sewing as much as I do. Thanks for the chance!! I love this fabric, and if I won I would attempt my first quilt. I feel much more confident after your videos! Love this fabric! I need to make a baby blanket – my niece is going to be born in about 2 months and this fabric would be perfect! I love the prints and the colours. I hope I win. I would love to try and make a quilt. I love the fabrics and your quilt. I would make a lap quilt. Thank you for the chance. 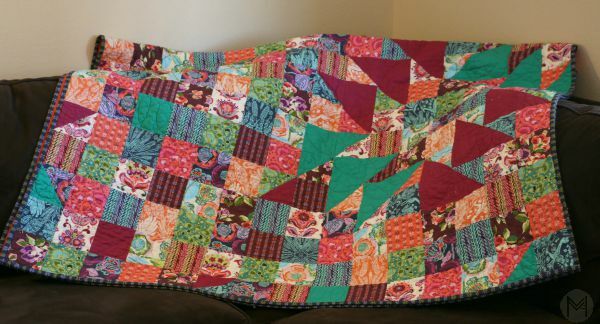 Your quilt is amazing – I love saturated colour and lots of colours together. I would use the prize to make something like your quilt. Does your quilt have a pattern? It is awesome. Your quilt is gorgeous! And, as a newbie quilter, I sure appreciate your video tutorials! Being that I need the practice, I’d love to use this fabric to make a mini quilt to hang up in our living room space. Thanks for the chance! I would make a quilt to showcase this vibrant fabric! I love the tutorial and the quilt! So, I imagine, I would use the fabric to make my first quilt following your awesome tutorial. I wpuld make a lap/baby quilt of the gorgeous fabric! I would incorporate some applique with the gorgeous fabrics in a quilt! Thanks for a chance to win! I love your quilt! I would definitely make a quilt if I won, and I would dearly LOVE to win! i would love to win the fabric and make a quilt for my new daughter! I would love to make a quilt from this beautiful fabric! I would make a baby quilt. I have two friends having babies this winter. I have almost finished one boy quilt, but I still need to start one girl quilt and this fabric would be perfect! I’d make a quilt to pass down to one of my daughters. I recently finished my first quilt and I have two daughters, so this would be fitting to start another for my second daughter. If I win I would like to make a quilt with it. I think I would make a quilted table runner. My kitchen needs some bright cheery colors. 🙂 I have thoroughly enjoyed the quilting series. Looking forward to learning how to crochet with you. I would make a throw quilt for my daughters new apt! These colors would look lovely there! Thanks Melanie! I would make a quilt for my almost 4 month old baby girl. I would make a quilt for my great niece. I love the colors in this happy, delightful quilt and would use the fabric to make my son and daughter-in-law a quilt. They live in the Bay Area which is cool most of the year. This would surely brighten their home on a foggy, dreary day! I would make a charity quilt. It would me my first project ever! If i won the fabric, and first time i won anything in my life. I would make a baby blanket for my baby girl. These fabrics would be perfect for a bag I have been wanting to make. The Wanderlust Collection by Amy Butler. Thanks for the giveaway Melanie! I would incorporate them into a crib size quilt! I would love to get these squares! I would make a quilt wall hanging for our guest room. Such fun colors and a welcoming feeling it would at to that room. Great tutorials!! I am just learning the basics on making quilts so this would be for my first project. Your quilt is fabulous. I would most likely make a table runner or a purse out of the fabric. I would make a quilt with more of the circling geese. It’s my favorite design feature. I would use it to make a mini quilt for the swap that I am in. Such beautiful fabric. Thanks for the opportunity. I would love to make a baby quilt for my niece. I would make my very first quilt out of it. It would be so neat to make my first quilt out of fabric from you since you have inspired me on so many levels of creativity. I have been subscribed to your youtube for well over a year and everything you make i make along with you lol. You are so creative! I would donate the fabric to a lady in Spring Hill FL who makes small baby quilts for the babies in the NICU. The patents of these infants cherish the quilts. What a beautiful act of kindness this lady provides freely to these precious little infants. I meant parents not patents!!! Since learning how to quilt last year I have given everything I have made away so I would love to have this amazing stash to go towards a scrappy quilt for own home! I would love to see my family snuggled up under a quilt I made. I would make an Amy Butler purse, I have so many of her purse patterns, I absolutely love them and her fabric! I would love to make a quilt for my grandmother. She made me one when I was a baby and I have kept it since then. She said she would teach me but lives in Mexico so I hardly see her. I can use these videos and learn to make her one. All I’m missing is good quilt material. I would like for her to have a quilt made by her eldest granddaughter knowing that she was my inspiration. Beautiful colors! I would make whatever I could with them. I am fairly new to sewing so I watch you on YouTube a lot for your easy to follow tutorials. The box bag was my favorite. I would love to use this fabric to finally make a quilt for myself. I have made one for everyone else but haven’t managed to find time for me! If I won, I’d make a quilt for my granddaughter, it’s her turn for the next quilt. If I won I would start a quilt for my son. I love to watch your videos ! I would make a quilt for my son to take with him on his next tour overseas sometime next year as a snuggie with pictures of his children. I would use the scraps to make a small quilt to practice since I’m getting my sewing machine this weekend!! Yay!! I’m so exited to start learning how to sew and follow along your tutorials! ? I’d love to try out my new sewing machine and make a quilt! I would make a pinwheel wall quilt if I won . I would love to win! I would make a quilt with this gorgeous fabric. I’d like to make a quilt for my guest room. I love how rich and warm these colors are. I love this collection so much! I’d use this fabric to make a quilt for my sister who has battled depression for many years. I think the bright colours would really lift her spirits! Sorry-I posted twice by mistake! whoops! A couch throw! 🙂 Thank you for the chance! 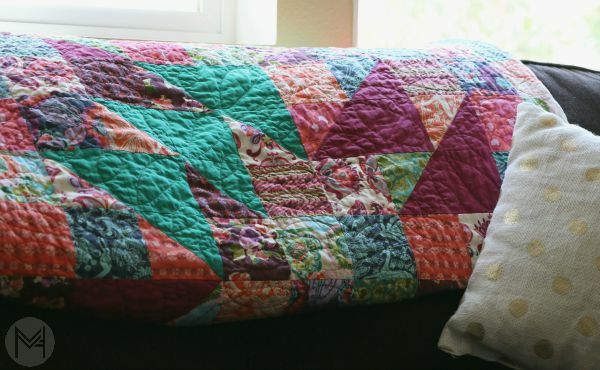 What a great quilt design, and beautiful way to showcase such a vibrant collection! I would use this fabric to make a quilt for my sister who has battled depression in the last few years. 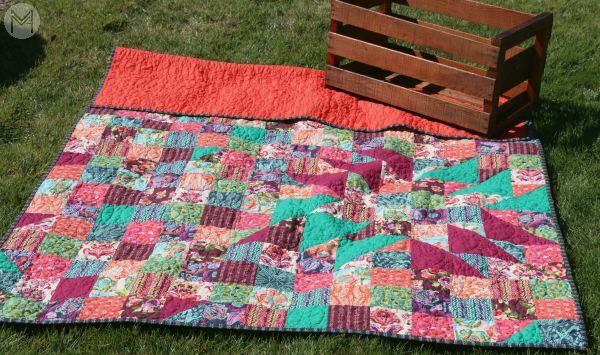 She loves pinks, so a quilt in Bright Heart would be the perfect pick-me-up for her! I would make a quilt for my son. He is away from home for the first time. He is an intern at a church in Atlanta. I would love to surprise him with a gift from home! I’d make a baby quilt – I need to make three by November!! If I won the fabric I would use it for quilts for a hospital in Africa. Our church is in the middle of making stuffed bears, receiving blankets and small quilts. The children that come in have nothing and every little bit helps. How sweet of you! I would use this for a Christmas grab bag quilt. Thanks so much!!! I wish to win this bundle! First thing I would do if I were to win is smell the bundle! I love the smell of new fabric! It just gets me to start something right away. I was hoping to make a quilt. It would be my very first! I need some new placemats and these colors are so beautiful. Thanks for a great giveaway!! If I won, I’d love to make a wallet and tote bag with the fabric. It would look gorgeous! I would love to win this lovely fabric. I would make a quilt for a sweet friend who is going through her 2nd round of chemo and fighting cancer in a most valiant way. Loved the video series!! I love the fabric, it’s absolutely beautiful! I always look forward to your e-mail updates so I can see what new posts are up and I love all your tutorials. In fact, my first ever crochet blanket was made using your tutorial! Thank you for sharing your knowledge with us! I would spread them all out, add some of my current fabric stash then aim to make me a quilt for a change! Just made one for my bestie and my sister, now I need a picnic blanket. That is a beautiful collection of fabric and I would love to be able to include them in one of my next quilts. Thank you. If I get to be the lucky winner of those beautiful fabrics I would most certainly invest it in making another quilt (my 2nd) following your amazing tutorials. I’m so excited as to how my first one is coming out that I just can’t wait to do it all over again. I am disable and quilting has turned out to be very therapeutic for me. I’m so grateful that I chose you to follow on this awesome journey. Again thank you for your instructions and kind words. God bless you always! I would make a quilt, or maybe a patch work dress, or maybe quilted wheelchair and walker pouches for the retirement home. thanks for such an awesome chance to win such a great prize! I really love those fabrics and would make a warm quilt for my sister to use when she takes her two dogs for a ‘walk’ in her wheelchair. Thanks for this quilting series, I learned a lot from this and have watched different parts serveral times. If I won I would make a couple bags and pillow cases for my friends!! I just had a baby girl 2 months ago and I would love to make her a quilt. It would be the first thing that I will be making for her and these fabrics would be great. If I won I would make a rag quilt. My kids always fall asleep on the couch and I’ve been thinking off making them one for that specifically. Thank you for the opportunity to win ? Love your quilt and the fabric! I would use the fabric to make somecdecorative items for my home.,Thank you for the give away, and the video series. If I won the fabric I would use it to make my very first quilt for my daughter to take to college next year! Thanks for all the awesome videos! You’re extremely talented. Can’t wait for the next video! Loved the quilting video series. If I won the fabric I would make a quilt practing the techniques that was taught in the five quilting videos. 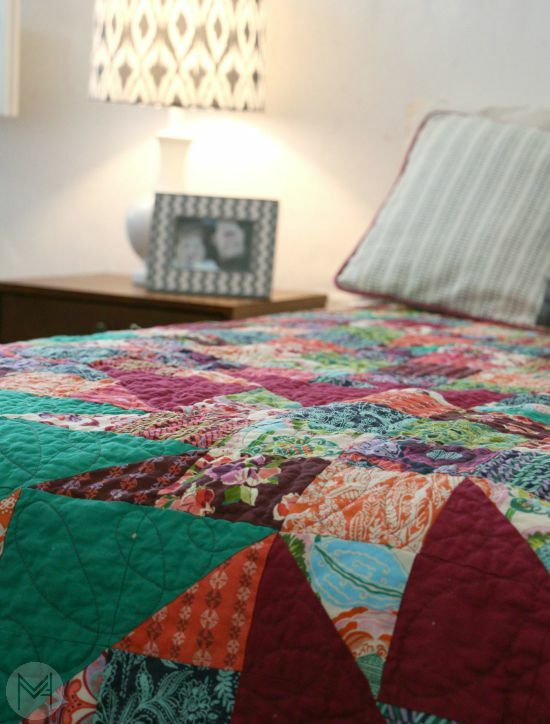 It would be a great reminder of the fun of learning to quilt from your videos! Thank you. Planning to make a quilt for first time for my mother in law who lives with us. She has dementia and her favorite color is purple! This willl be a fun project. ill try writing our names on it! Hope I win! I would make a beautiful quilt for my beautiful mother, who deserves a little more beauty in her life. I would make mini quilts for my granddaughters dolls. Your videos are so easy to follow. I started with your crochet videos and have learned so many beautiful stitches. I have had several people try to teach me and I just couldn’t catch on. Your videos were so helpful that I now find it so hard to put down a project. Just one more row or square or round… is what I tell myself. After watching you quilting series, I believe I’ve found another fun hobby! Thanks for making it so easy to understand and fun! I would make my first quilt ever and give it to my first grand baby due in October. ? If i won the fabric I would make a throw blanket quilt for my stepfather! He loves fun colors and was just diagnosed with Lymphoma and I want to give home something to keep him cozy during chemo. I’d love to get started on a quilt of my own!! I’m just getting some practice at sewing so having a bigger project to work towards would be super motivating!! ? I would make a quilt for me!!! Everything I make I seem to give away!!! If I won this fabric, I would make a quilt for my 8 year old daughter. She watched the videos with me and she just loved all the colors. Thank you for making this quilt series. It has helped me improve some things on my sewing and some confusion I’ve had in the past when making a quilt for my baby niece. You are an inspiration ? The quilt making videos were terrific. I’m not new to quilting, but I enjoy watching for tips and new designs. This quilt is a beauty in color, fabrics and design. Thank you! I wad love to win the bundle of fabric? I am so addicted to sewing after watching your videos amongst others. Loved the 5 on quilting and I’m really trying to get the hang of the fmq. I would make another quilt or part of one with fabric from you! Love your videosso much! If I won I’d make a quilt – I’ve only made one so far and it would have been so much easier if had been able to watch your quilting series first! I would love to win this fabric! It would be the start of my first quilt ever! I’d make it for my hubby to take with him when he’s gone away from home. My daughter just left for college so I’m reconnecting with my love of sewing. I have never made a quilt but would love to give it a try! I look forward to watching your quilting series. Thank you for the great videos Melanie! I love your videos! You have inspired me and I’m now working on my first ever quilt! If I won the fabric, I’d make a blanket for my daughter! Would love to win that fabric. I would make my newest grandchild that is due early next year a quilt. Thank you for your inspiring blog. I’ve loved this series so much! Have never made a quilt before but having watched these a few times I feel like I have everything I need now and feel pretty confident about giving it a go… I just need the fabric! ? if I won I’d use the fabric to make a blanket for my two gorgeous nieces! They love to snuggle up and watch Disney films, I live away from home and only see them once a month so would be nice to think that instead of getting cuddles from me they can cuddle up under the blanket ? With Christmas coming up, and money tight this year, I would use the fabric to make gifts for all the deserving people in my life! Homemade gifts are better than bought ones anyways, right?! These are beautiful! If I had the fabric I’d make a small throw sized quilt for my daughter. She loves to cuddle. And thanks so much for doing this series. It was so helpful to a beginner like me! Firstly I’d like to say how much I love your quilt & the series of tutorials. I am still a beginner quilter but your guidance makes everything seem possible! I have watched every single one of your tutorials and can’t wait to learn the art of crochet too! I’ve tried to catch your live videos on Facebook but with times being so different here in Australia it’s not always possible. I would love to win this fabric, living in a small country town in Australia we don’t always get the chance to work with such amazing fabrics. If I was to win this fabric I would create a baby quilt for my new edition on the way! I would love to make my very first quilt for my future baby, arriving 1/2016!! I would incorporate the fabric I win with other fabric for a quilt, or placemats. Love the colors. I’d make a mini quilt 🙂 and if there is some fabric left, I think I’d make a scrappy fold over clutch! I love all the colors of your quilt. I would make a quilt similar to yours. Just learning to quilt, so don’t have a stash. Your quilt is beautiful. 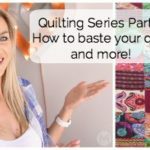 I would love to make the quilt you made in this series! The fabric looks beautiful in that pattern. If I won this fabric I would make a mini block scrap backingthen make a crochet hook. Case. It would look super cute! i would make a quilt using your tutorial. I would like to say it would be for someone else, but since I have fallen in love with this fabric….it would be for me! If I won this, I’d like to finally work on a quilt and put my sewing machine to some good use. Might even make an heirloom to pass down to my daughter. I really like the bright colors. First loved the quilt video’s. Trying to inspire my own girls , I would make a quilt ! Scrappy the better! Thank you for giveaway!! I would let the fabric inspire me as to what to make once I could see and touch it. I would love to make a quilt I’m in the learning process. I have learned so much crocheting from your videos and this quilting is next on my list. Thank you have a blessed day. I would love to win the fabric, havent purchased any fabric for a while now. I would make a lap quilt for my mom, she hasnt been well lately and she has always wanted me to make her a quilt. Loved the videos, great job. I would make a toddler quilt for my daughter. I’d make a quilt, of course! I would make a lap sized quilt. Love the fabrics. Thank you for the inspiration, and the giveaway. I would love to win this fabric to make a beautiful quilted tote to carry my projects in. If I won the fabric, I would make a quilt with it. Because of you, I’ve been trying to quilt! I’m hooked on your videos. I’m sure I can speak for a few of us! Thank you for your helpfulness. And easiness of them. Love to sew. Love to quilt. Love to crochet. Would love to knit. All things crafty. I’m so in love with this fabric and would love to do a baby quilt with it!! I would start on a quilt for my daughters , ones 4 and one will be born in November. And give or take on how much fabric I would love to put the fabric in frames and hang them for my girls rooms. Diy all the way. I learned to sew with a super old kenmore machine while taking a quilting class about 7-8 years ago. I love all the projects I can make now that I know how to quilt and sew. I’m dying to work on another quilt top but keep putting other projects in line ahead and I’d use the fabric to get me going and finally start another quilt! The likely possibility of moving from super hot south Texas to much colder southeast Alaska also should be good motivation to make a quilt to snuggle under! I purchased a new pattern recently for a scrappy quilt and would love to add this to it. If I were to win, I’d get started on my first quilt, for sure! I would use it to make a quilt for my 13 year old niece! She’d loe the bright colors, they match her personality. If I won, I would make a quilt for my sewing room daybed that we just purchased! If I won this fabric, I would make interested quilts for my children! Beautiful patterns! I know I could never quilt to your awesome standards, but if I won I would make my best friend who is fighting cancer a beautiful lap quilt. This fabric is gorgeous, and it would make her a wonderful snuggler. Thank you for showing all of us your incredible talent. God has really blessed you! I would use this fabric for my niece to make her a baby quilt! I would make a quilt as you go bag to start my projects for an up and coming craft show in December. I would use the bright colors to make a quilt for my grand daughter, she would love it. As funny as it sounds, I would use the fabric to make quilt looking egg collecting aprons for my niece. I love these fabric colors! I would make your box pouches with the fat quarters and probably use the squares in a quilt!! 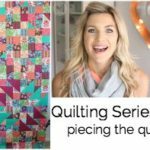 This quilting series was so great!! What s lovely giveaway. I just recently joined the local modern quilt guild and everyone seems to able to finish at least a quilt a month, I’d like to at least be able to make a quilt every few months, I think the fabric leftovers would make a lovely quilt. I would love to use these to make quilt for my daughter who will be going to college soon. 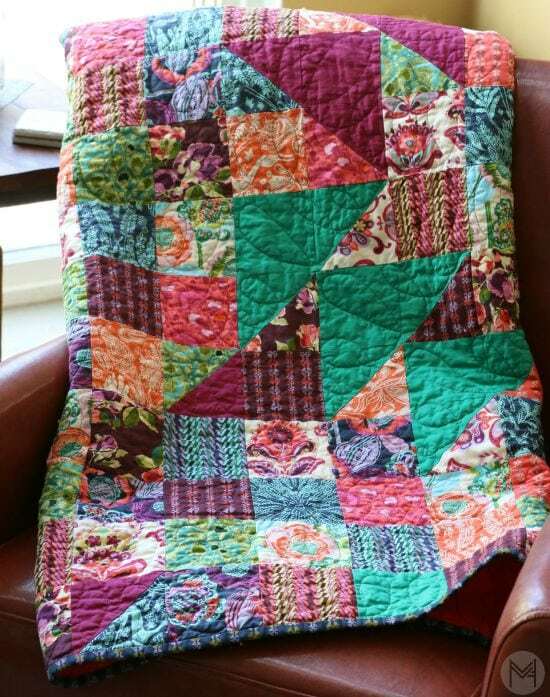 If I won the bundle I would create this beautiful quilt with my Mother-In-Law! She is such a wonderful woman that I greatly admire, and she is a phenomenal quilter! I aspire to be like her in my every day life, as well as half the quilter she is. Your series gave me the confidence boost I needed to start my own quilting journey, and I love the fabrics you chose! Your giveaways are awesome! I would love to make a quilt with this fabric if I win! I love how informative the quilting videos are…..you’ve inspired me! I would love to try to make the quilt in your video! I love the scrappy look, very comfy. If I win the fabric, I would like to try and make a quilt like you did, no matter what the size. It is a beautiful quilt and would be pretty on a bed, as a throw blanket, wall hanging or pillow. Thanks so much for your videos!! Please edit out my last name. I had no idea it would appear. If I won the fabric it would give me the motivation to get back into my sewing room and make a quilt! Everyday I look at my sewing space and say to my self you need to get in there and create. I just love to sew! Love your channel! Thank you so much for sharing you talents! I would love to use this fabric to make a quilt for my mother for Christmas. Thanks so much for the chance to win! I would get started on my very first quilt! These videos have definitely inspired me to try it out. Can’t wait. I would love the opportunity to make a raggy quilt for one of my daughters using those beautiful fabrics. Thank you for sharing. 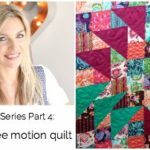 I think I’d make a quilt and try free motion quilting! I really enjoyed the video series! Ohh Ahh! I love the color and movement in your beautiful quilt! I would definitely use your videos to make a quilt like this. Thanks for the generous giveaway, and thanks for all the inspiration and eye candy! If I won I would make my 1st quilt… u make things so easy to understand… I watch ur crochet videos & dont struggle! U R AWSOME! thank you for the opportunity! I would love to make a quilt for my best friend from college who I sadly see only once per year at best. She and her baby could use it to snuggle up in during the long, cold Michigan winters. HI, such a neat giveaway! I’m sure I’d make a quilt! Beautiful! My daughter is learning to sew and this would be fun to try. Hi Melanie. If I won this amazing stash of fabric I would make my nan a quilt. She has recently gone into a nursing home and I would like her to have something special. I would learn to make my First Quilt if I won this Awesome Fabric!! I think these vibrantly colored fabric may get me out of this slump and get sewing again! I would use these left overs to mix in with my other Amy Butler stash and make this quilt! Gorgeous quilt- I would definitely use it to make something for the little grand babies! I’d love to make a colorful quilt with that fabric. How gorgeous! I would make a leaders and enders quilt. 🙂 Thanks for the videos!!! Thank you so much for all the videos you have done. All of your videos are easy to follow and produce great looking crafts! I would love to make my “battle buddy” and baby blanket out of this material. When a disaster hits this state, we get called out together. This is her first daughter and I can’t wait to meet her! I would make a baby quilt…my favorite right now! Thanks so much for the tutorials! Hey Melanie! Thank you for making this series! I was a little apprehensive about making a quilt myself but you answered every question that I thought of! If I won the fabulous fabric I would make a mini quilt for my friend’s baby girl. She is due at the end of September. I love the things you are able to create! 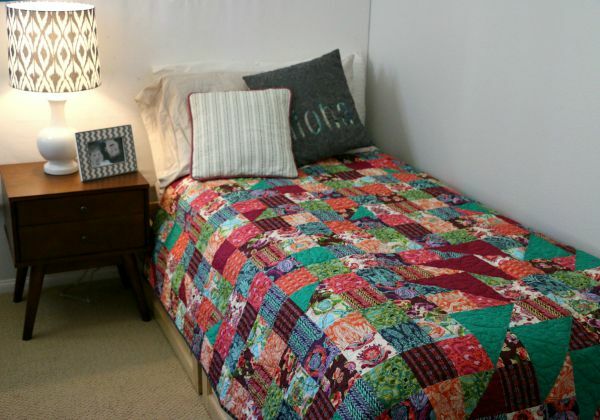 I would make my very first quilt with you tutorials and those pretty fabrics. I would get started on my first quilt for my baby, which will be born in January. I would love to try making a quilt. Those colors would look great in our newly redecorated bedroom! If I won the fabric i would add it to the quilt I’m making for my military serving husband to have when away from home (which is alot at the moment ?). Home comfort. I have two grandbabies on the way and would love to be able to make a quilt for them, thank you for the chance. I would love this to start my new quilting adventures. I found your blog posts and totally want to quilt everything I see. I am hunting for a sewing machine right now! Thanks for your inspirations !! I have enjoyed this series and would love the scraps to make a quilt. If I won I would hopefully create something as beautiful as you did! Wow!!! This would be awesome to win as I love the prints in this collection!!! If I were ever so lucky, I would make a quilt. Thanks for the chance!! If I won I would make a something for my daughter. I love your quilt tutorials! I love your videos and can’t wait to try making my first quilt! It will be a great head start since they are all precut. Thank you again for your videos! If I won I would hopefully create something as beautiful as you did! I have been watching your series and you do an amazing job! Thanks for giving of your time. i would love to use that fabric to make a colorful quilt for a little girl battling cancer. Each year the quilting guild that I belong to makes and donates quilts to a camp for kids with cancer. I could see a little girl loving a quilt made from that beautiful fabric! That’s a beautiful thing to do. Hi Melanie! This series has been awesome I have definitely shared with friends and family! If I won the giveaway I would make my newborn baby girl a cot blanket. Thanks heaps! Not gonna lie, I would just sit the fabric on my desk at work for a few days. I like having fabric on my desk so when I have a stressful day I can look at it, feel it and then it calms me. Then of course I’ll probably use this bundle to attempt my first small quilt, would be perfect for my daughter! I would TRY to make a quilt following all your videos and hope it comes out nearly as good as yours!!!? The quilt looks amazeballs ! I think I’d have ago at making some dresses for my granddaughters Alice and Rosie ? I would make a plus quilt. Thanks for the chance to win. I love bright heart!! Hello!!! First of all, congratulations on your quilt, it’s absolutely amazing! So, with all of these fabrics I would do a blanket to offer to my sweet mother on christmas thanking her for all of her support she gave me this year in particularly! Loved this series!! I would make my mom a lap quilt with this fabric as a thank you gift for helping me with my daughter so much! I would immediately turn this into a quirk for myself and my daughter to share. I’ve been loving this fabric in your project and can’t wait to get some for myself!! I would definitely use these in a scrappy quilt that I’ve been hoarding squares for for what seems like forever. If I won this fabric, I would make the most adorable mini quilt for someone I work with! Thanks Melanie!